Liverpool rolled out its red carpet this week as the ‘Three Queens’ cruised into port as part of Cunard’s 175th anniversary celebrations. For the first time in maritime history, all three of the line’s leading ladies met on the Mersey River. 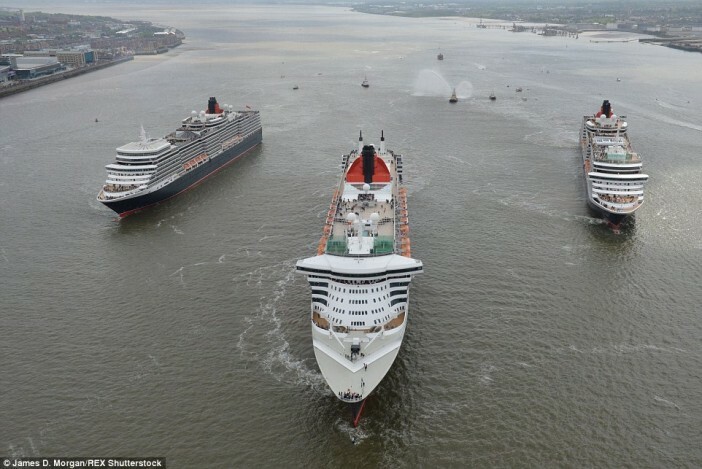 Together, the Queen Mary 2, Queen Victoria and Queen Elizabeth thrilled crowds of onlookers with a choreographed ‘river dance’ that marked 175 years at sea for Britain’s iconic Cunard cruise line. The event attracted an estimated 1.3 million people hailing from Liverpool, and beyond. As well as celebrating 175 years at sea, the Mersey River celebrations honoured the line’s long-standing relationship with Liverpool. The company operated its headquarters in the city until the 1960s, with a huge number of executive decisions being made on the bank of the Mersey River. Angus Struthers, Cunard director is one man that feels the connection more than most, explaining that “Liverpool and Cunard have grown up together and that bond will never be broken.” Wendy Simon, a councillor at Liverpool City Council was amazed by the turnout and commended the local community for its enthusiasm and appreciation for the city’s maritime history. “It’s fantastic that the maritime history of the city is being passed down the generations,” she says. At midday Queen Mary 2 took pride of place between her two sisters. Together the trio sailed in formation along the Mersey before a fly by from the Red Arrows filled the sky with plumes of red, white and blue smoke. On dry land revellers were treated to live music, street entertainers, food stalls, souvenir stands and more. As the sun set spectators were treated to yet another spectacular show. At Pier Head the Three Graces buildings were lit up by a projector that took viewers on an explorative journey of Cunard’s history with the city of Liverpool. The evening concluded with a dazzling fireworks show that celebrated the line’s past, present and future achievements. Over one million people flocked to the banks of the Mersey River to catch a glimpse of the Three Queens cruising into port. They weren’t disappointed, with the sight of three luxury cruise ships sailing side by side truly something to behold! Local maritime enthusiast Fred Wilson was just one of many who appreciated the sheer scope of the event. “I’ve been into ships for a long time and what’s happened in Liverpool this bank holiday weekend will make history. That probably won’t ever happen again in my lifetime. It’s a privilege to see,” he says. As well as creating a wonderful mood, the Three Queens event was also fantastic for the local economy. According to city centre businesses hotel rooms were booked out weeks in advance, restaurants ran out of food and bars were practically drunk dry. It was a weekend to remember however like all parties, this one had to come to an end. Queen Victoria was the last to depart, sent off with a musical farewell and a cloud of balloons. As she sailed out of Liverpool Cruise Terminal singer Danielle Thomas performed ‘You’ll Never Walk Alone.’ But that wasn’t the last of the final revelries. Before disappearing into the open ocean Queen Victoria wowed crowds by doing a 360 degree twirl accompanied by a playlist of classic tunes from The Beatles.